Properties in Winnipeg have a lot to contend with. Between a months-long snowy season and rain throughout spring and fall, moisture is a major threat to properties in the area. Excessive rainfall and snow melt can mean slushy sidewalks, but they are also bad news for your roof – but our Gorillas are here to help. Our Winnipeg roof clearing and moss removal service is ready and willing to protect your property from the elements and extend the life of your roof! The west coast might be known for its rainfall but prairie properties have their own problem areas. Harsh seasonal changes, as well as every-day weather deposit organic materials all over your property, but especially on rooftops. Having a cluttered roof affects your property in several ways. The most obvious consequence of having roof clutter is the negative aesthetic. From street view, having a lot of debris on your roof can make your home or business look uncared for and cluttered. When heavy winds pick up, the clutter on your roof can blow into the gutters around your property, clogging them and making drains impassable. In addition to looking messy and clogging drains, organic debris left in the surface of your roof retains moisture and holds it against surface material. This moisture can lead to growth and spread of moss across your roof. Moss growth and moisture can creep under shingles, damaging the materials underneath. Regular maintenance can prevent damage caused by water leaks, flooding and mould growth. Property owners have experimented with harsh solutions like pressure washers to blast away moss, but only professional care can get great results without the risk. 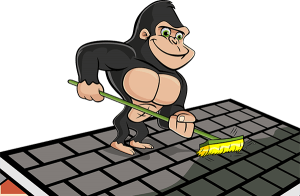 Gorilla Property Services has been in the property maintenance industry for decades. Over that time, our technicians have picked up all the best methods for getting the best clients the best results possible. Safety is a top priority for our Gorillas, using proper tie-offs and precautions in order to get our technicians on the roof and help them stay there.